This post is sponsored by Bounty Paper Towels. The content presented is all mine. 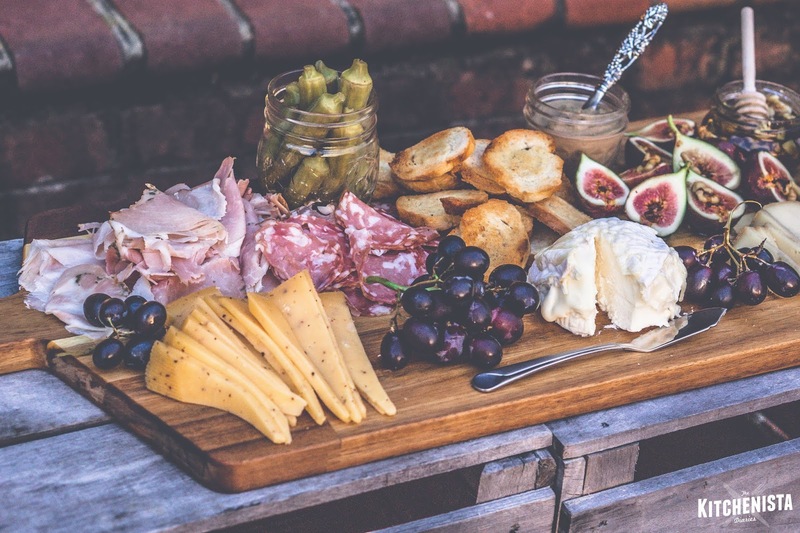 These days, I plan most of my dinner parties around charcuterie and cheese as the starter. It's a wonderful ice breaker, encouraging guests to talk to each other as they eat their way around the board and share suggestions on how to mix and match the offerings. For casual get-togethers, a charcuterie and cheese board can be bountiful enough to serve as a light meal, especially when paired with wine, beer or cider. If you're ready to take a stab at putting your own boards together, read on for tips I found helpful. 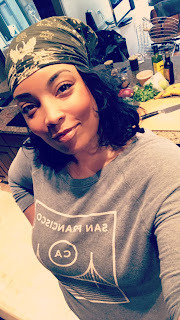 And because I'm never without my trusty paper towels for kitchen prep, I've got a few Bounty Paper Towel hacks sprinkled in with these simple entertaining tips! 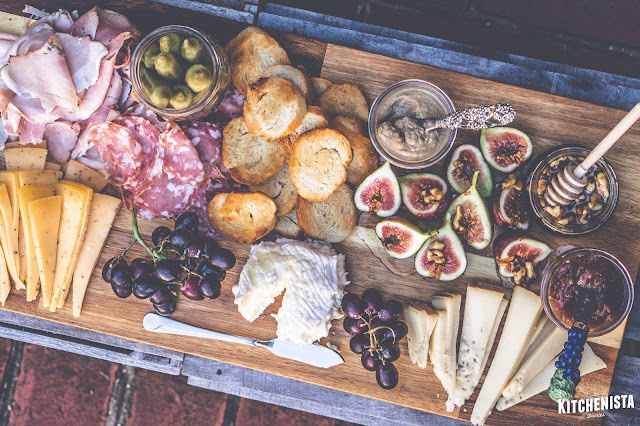 You'll obviously need a way to display and serve all this lovely charcuterie and cheese to your guests. But before you feel stressed about dropping money on a fancy board, consider whether you already have a decent wood cutting board that will do the trick for now. By the way, I've noticed that standard cutting boards are often priced lower than chopping blocks specifically marketed for charcuterie boards. As long as you get something that's food grade, buy what works for you. Looking for some quick tips on how to maintain a wooden cutting board? Wash it with soapy water after each use and dry thoroughly. 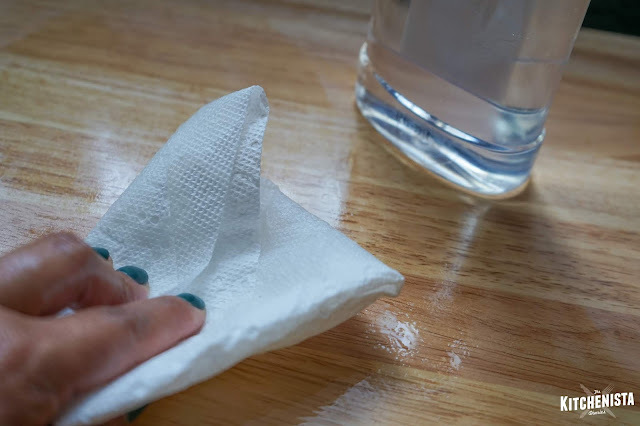 Bounty Paper Towels are extra absorbent, so they'll soak up every bit of moisture, preventing your board from warping over time. Every few weeks, treat your board with mineral oil. Pour a quarter-sized amount of oil onto a section of the board and use a sheet of Bounty to apply the oil over the board's surface. Repeat with additional oil if needed. Once both sides are treated, allow the oil to penetrate for a few hours, or overnight. 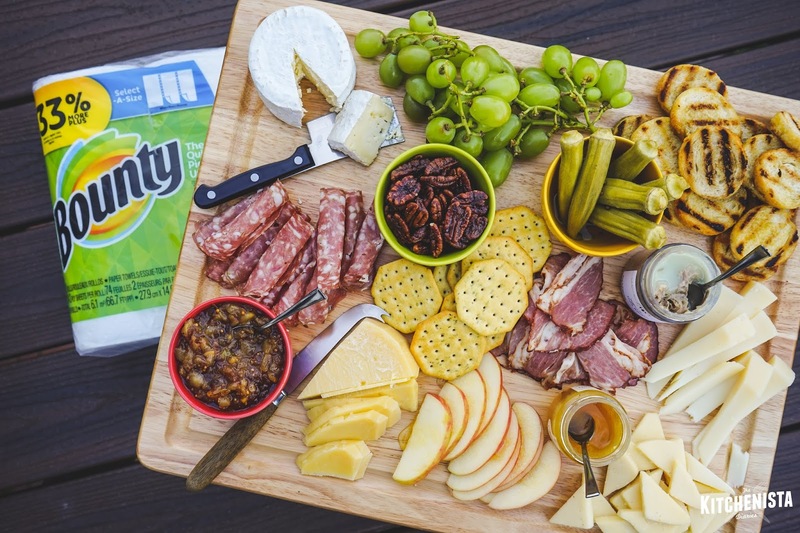 Wipe off any excess with a clean sheet of Bounty and your board is now ready to use again! It's helpful to think of the ways cheeses are categorized in order to pick a variety for your board. Fresh cheeses are rindless, not aged, and typically mild and tangy in flavor. Includes goat cheese logs, farmer's cheese, feta, burrata, mascarpone, and ricotta. Soft, bloomy cheeses are exceptionally creamy, often spreadable, gooey or spoonable. They have a white molded, edible rind that tends to have a stronger, funkier flavor. The cheese inside can vary in intensity of flavor. This category includes Brie, Camembert, La Tur, or Brillat-Savarin. Semi-soft cheeses range from stretchy to fudgy in texture and are typically mild in flavor. They might be creamy but are sliceable and not spreadable. Think Mozzarella, Halloumi, young Goudas, Havarti, Edam, Colby, and Monterrey Jack. Washed rinds are bathed in beer, wine or other brine. Many have a characteristically orange or red hue. Fontina, Taleggio, and Muenster fall into this category. Other cheeses in this category have rinds that are coated in other types of edible mold or ash. 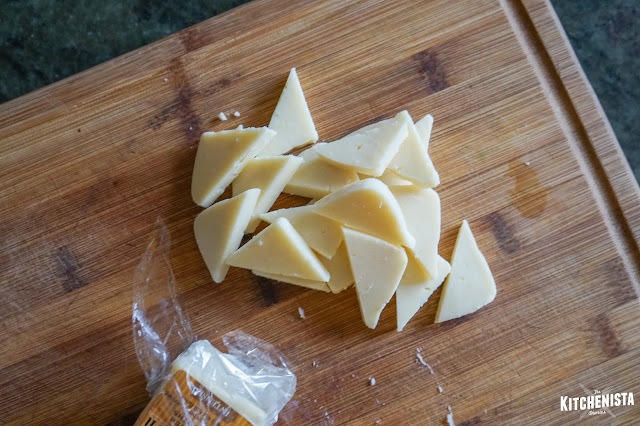 Semi-firm, firm or hard cheeses can be sliced or grated, while some crumble or break into shards. Ripened cheeses in this category take on more complex flavors. They are usually without a rind. Numerous cheeses fall into this category, such as Jarlsberg, Provolone, Comté, Gruyere, aged gouda, aged block cheddar, clothbound cheddar, aged Asiago, Mimolette, and Parmigiano Reggiano. Blue cheeses like Stilton or Gorgonzola have veins of blue mold running through the interior. They can be soft to crumbly in texture, with some on the milder side all the way up to pungent and funky. I don't always include cheese from each category on my boards, but I do try to ensure a mix of textures and range of intensity in flavor. I wouldn't serve all aged, sharp or ripened cheeses, which could blow your palate. I also wouldn't serve all younger, mild cheeses, because it's not enough to excite the tongue. Try to pick from each end of the spectrum, along with one or two that falls somewhere in between. Another thing to consider is whether you want to serve cow, sheep, or goat's milk cheeses, or perhaps one of each. 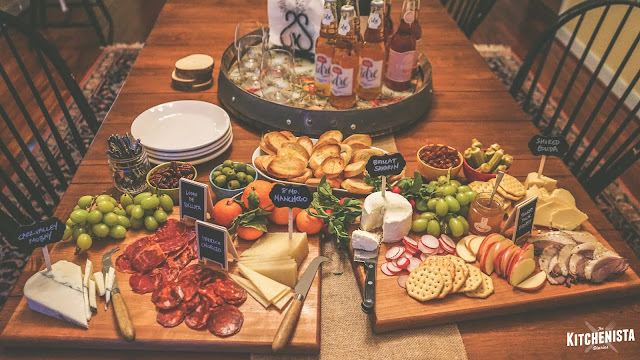 Creating a charcuterie and cheese board is like sending your guests on a culinary journey. You'd want them to experience peaks and valleys as they work around the board. I'll often throw in a wildcard - maybe a truffle or herbed cheese, smoked cheese, one that has flecks of dried fruit in it, a spicy buffalo flavored cheese or something funky or "stinky" for the most adventurous palates. Cured sausages, which are sliced into rounds like chorizo, soppressata, and saucisson. Most will be pork, but it's not impossible to procure sausages made from lamb, venison or other game meats. Whole-muscle cuts, which are usually shaved thin, like prosciutto, Serrano ham, country ham, and roasted pork. Non-pork alternatives include bresaola (air-dried beef tenderloin), or smoked duck breast. Paté or terrines, rillettes, mousse, etc. These offer a fun change in texture from the rest of the charcuterie board, presenting intense or luscious flavors for meat-lovers who appreciate the treat. They are typically made from pork, chicken, duck, or a combination. For this board, my client requested non-pork charcuterie. I was able to find lamb sausage, beef bresaola, and smoked duck breast from my local butcher. 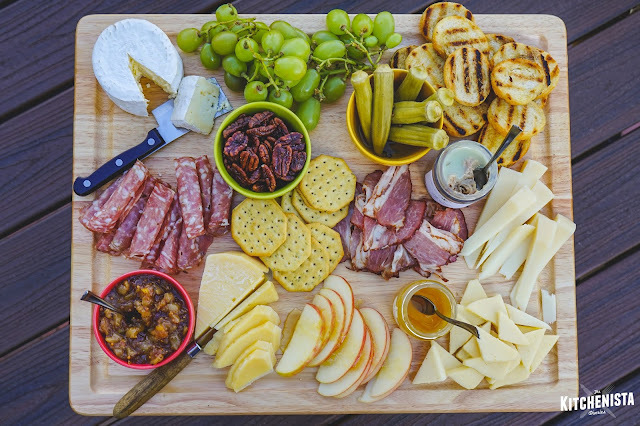 Charcuterie and cheese boards present an excellent opportunity to show off your latest artisanal gourmet food finds and savor the season's best locally grown fruit. Splurge on the truffle honey and fresh figs. Break out the wine jam your jet-setting friend brought back from her trip to Portugal. You spent time and money to pick out the good cheeses, so why cheapen it with basic accessories? 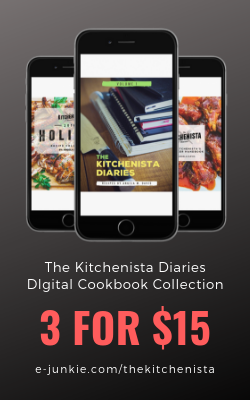 Let your most bougie, most sophisticated, inner kitchenista fly. If stumped on what to pair with a specific cheese, it's helpful to do a quick google search. (You don't have to be an expert on pairings, as there are plenty of suggestions out there for the taking.) Something I'm always pretty enthusiastic to add to my boards is pickled okra. I've served it with smoked goudas or cheddars, spicy smoky charcuterie like Tasso ham, and rich pâté or duck rillettes, like that below. 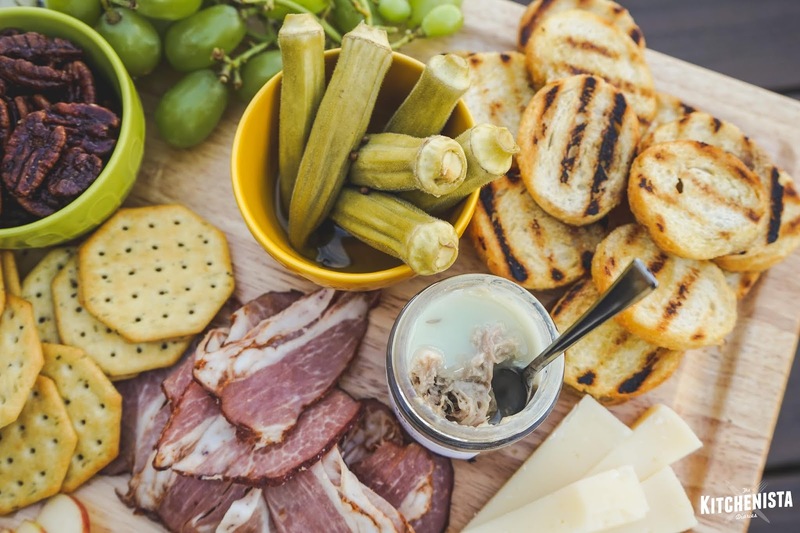 The idea of serving things like jams, olives, and crackers alongside cheese and charcuterie is to enhance the experience of eating it. Try to think in terms of how things are meant to be enjoyed. Will that soft cheese need to be slathered on bread, or could it be sliced and stacked on a cracker? Figs, apples, and pears are classic pairings that are going to play well with the vast majority of cheeses, but that doesn't mean you can't work with others. Especially in the spring and summer, when more produce is available, you could get pretty creative with fresh fruit and veggie crudités instead of putting together a traditional looking board. It's nice to have some drinks to serve alongside charcuterie and cheese offerings. Wine is a natural accompaniment, but consider craft beers or hard cider as well. (Do a quick search to determine what types of beverages pair with the cheese and/or meat you picked out. If you're hosting a more structured tasting, you may even want to present a different wine or cider with each cheese.) And here's another kitchen hack for you - ever forget to cool drinks but your company was on their way over? No worries! 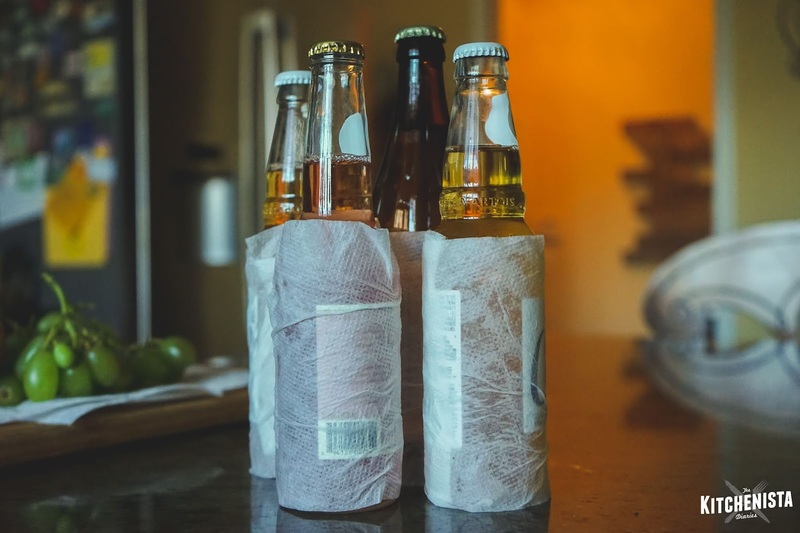 Just wrap bottles with a damp sheet of Bounty and place in the fridge or freezer for 10 minutes to quickly chill drinks. This works for everything from wine to beer and soda bottles! Be sure to put out enough glasses for your guests, as well as a stack of small appetizer plates, forks, and knives. The durability of Bounty also comes in handy to get those tough stains and streaks off cutlery. Simply soak a sheet of Bounty in vinegar or lemon juice, and use a little elbow grease to scrub until any blemishes have vanished. Follow with a wash in warm, soapy water, and use a clean sheet to dry cutlery thoroughly to prevent water spots. Also! The most important thing to remember is to set your cheese out an hour before you plan to eat. It needs time to come to room temperature so the textures and flavor will be most enjoyable. I do, however, suggest slicing cheeses when they are still chilled. Charcuterie only needs to be set out 10 to 15 minutes prior. As covered in the previous post, it's a nice idea to serve some fresh fruit on your board, so go ahead and get that prepped. 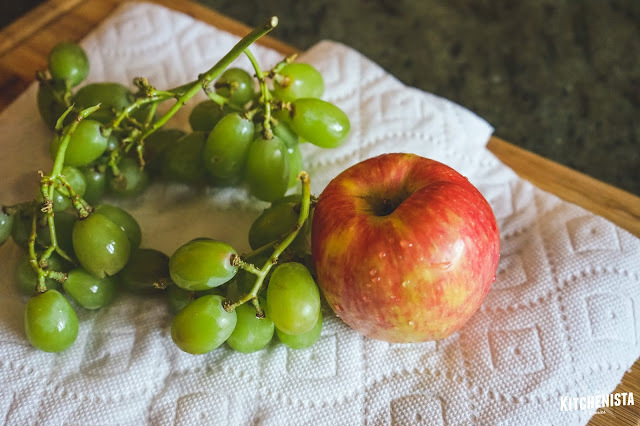 Rinse in cool water and use Bounty to dry the fruit. I love how quickly Bounty's absorbency works to speed up even the simplest prep steps. For grapes, pull off any that are bruised or browned prior to serving, and clip extra long stem ends. If you plan to serve sliced fruit, wait until just before guest arrive, so that it stays fresh longer. I like to squeeze a tiny bit of lemon juice over apple or pear slices to prevent browning. By the way, I try to keep my charcuterie boards separate from the everyday cutting boards. So all of the prep work here, like slicing cheese, fruit, and bread, is done on my cooking boards. I then transfer to the pretty charcuterie boards for serving, so they don't get all scratched up and stained over time. When serving bread, a fun way I like to upgrade crostini makes use of my cast iron grill pan. 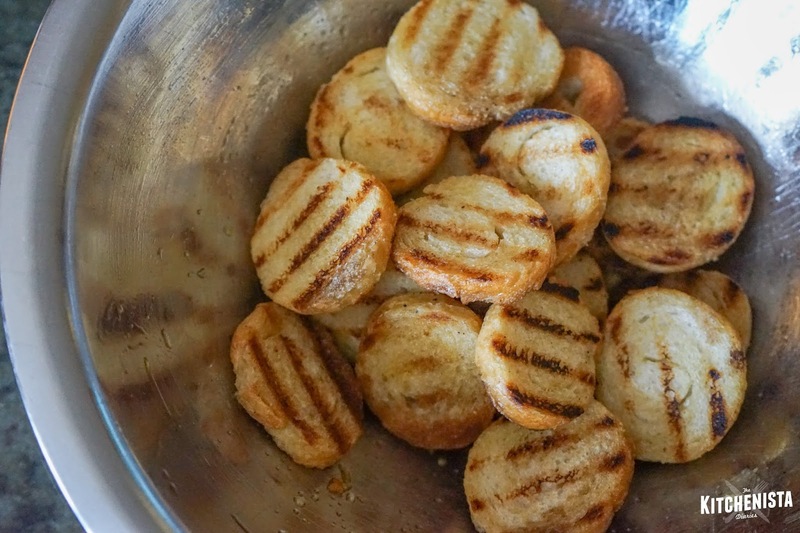 Simply toss sliced baguette rounds with a little olive oil. 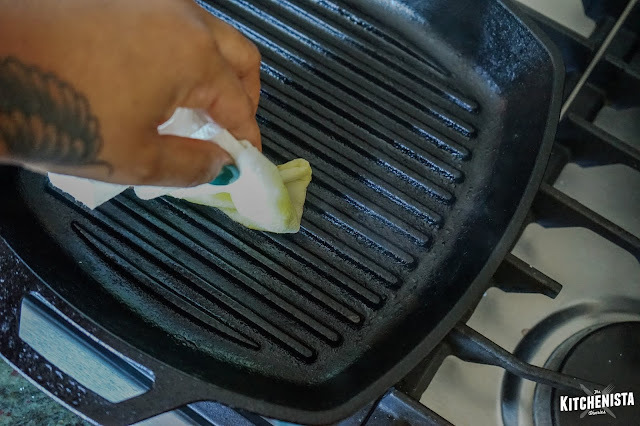 But before you get started, use an oiled sheet of Bounty to grease the grill grates, then turn the burner on and preheat until the grill pan is just shy of smoking. Grill the baguette rounds on each side just until grill marks appear, then set aside for later. This can be done in advance of guests arriving, but ideally within an hour or so of serving. 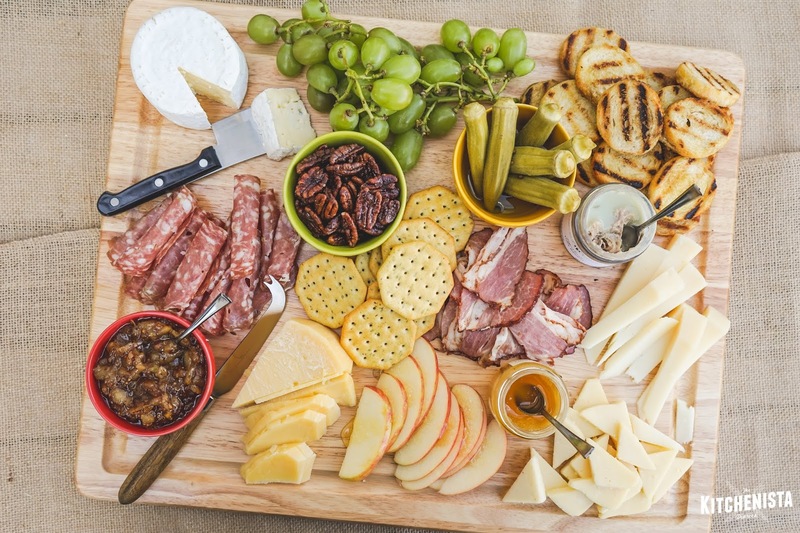 For arranging the charcuterie and cheese on your board, think in terms of how guests will be eating. They should be able to reach items easily - one of the reasons I'm not crazy about the Instagram trend of having an overly crowded board where everything overlaps. Looks pretty, but people will be hesitant to dig in and mess it up. Especially if you have cheeses that are left whole for guests to cut, you'll want to leave a little space to do so. You may want to make a few slices to indicate how the cheese is meant to be served. If you're serving fruit, chutney or other accompaniment to a specific cheese, it helps to have those duos paired right next to each other. I usually start by placing my cheeses in each section of the board, then I'll fill in the spaces with charcuterie and other items. The very last thing I'll add is fresh fruit, and in this case, I drizzled honey over the apple slices (this is also fun for figs!) I use my Bounty Paper Towels to tidy up any crumbs or dribbles as I move things around into their final destination. 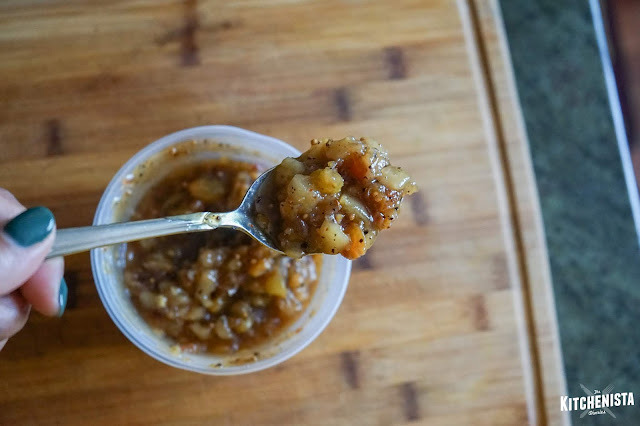 Make sure to remember small serving spoons for items in jars. If you have room, you can pile crackers and bread on the board itself. For larger events, I typically end up dividing my spread between two boards and adding items around the table nearby. If you have vegetarian guests, another way to do this is to separate the charcuterie and cheese on opposite boards. For this event, I also added small labels to identify the names of the charcuterie and cheese. It helps the guests know what they're digging into, but also a good memory jog for the host! Be prepared for people to ask questions about how to eat. That's part of the fun, so show them a combo or two and then encourage them to make their way around the board. Traditionally you'd start with the milder cheeses and work your up to the aged, more strongly flavored cheeses. But there are no rules, just have fun with it! I bought mini chalkboard labels to tag the names of the charcuterie and cheese for this gathering! You can pick up supplies at your local craft store. 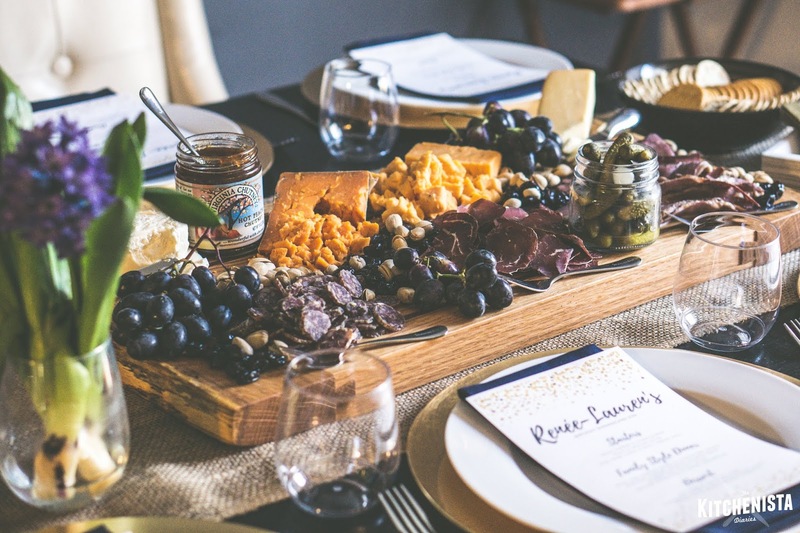 It's easy to buy everything you need for charcuterie and cheese boards, but if you have the time, adding some personal touches is a nice approach. 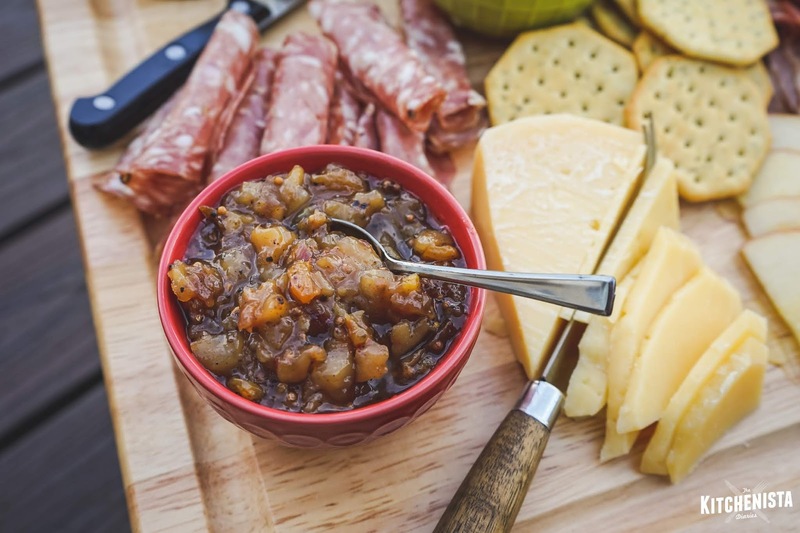 An easy way to accomplish this is to make your own fruit chutney, like this one made with pears. I served it on my board that featured an aged gouda and a triple creme bloomy rind cheese, each fantastic on a grilled baguette with a little chutney! Here's the recipe for that, loosely adapted from the apple chutney in The Art of The Cheese Plate , by Tia Keenan. *If you don't have mustard seeds, omit this step, and instead stir a teaspoon of course mustard into the chutney when adding the pears. Instructions: In a small pot over medium heat, warm the olive oil. Fry the bay leaf and mustard seeds until they start to pop, then add the shallots and pinch of salt. Cook, stirring frequently, for a couple minutes until shallots are softened, then stir in the red pepper flakes, cinnamon, and black pepper. Cook for a minute, until fragrant. Stir in the ginger and Worcestershire sauce and cook until most of the liquid is absorbed. Stir in the diced pears, honey, sugar, lemon juice and zest, vinegar, and raisins. Stir to melt the sugar, then bring to a gentle boil. Reduce heat and simmer for ten minutes, then add the nutmeg and cardamom. Continue simmering another ten minutes, or until the pears are fork tender and liquid has reduced by at least half. Remove the bay leaf and mash some of the pears gently with a fork to thicken the chutney. Season with a pinch of salt, if needed. Allow the chutney to cool completely prior to serving. Makes about two cups. Store in an airtight container in the refrigerator for up to three days.